With warmer weather finally on its way, Wine Rack Retailer, Wine Rack Store, is preparing for the usual surge of spring shoppers, typical for this time of the year. No host or hostess want to find themselves understocked on wine, thus the need for some sort of functional wine storage arises. As spring blossoms across the USA more customers are finally able to enjoy the outdoors. With all the prepping and planning for late spring and summer social activities on the horizon, wine storage retailer, Wine Rack Store, knows its got to be prepared for the upcoming shopping season. "The warmer months tend to bring people out of hibernation and out to their back yards for social activities," said Wine Rack Store President, Michael Kitson, "In my years of experience, we have found that no host or hostess want to find themselves understocked on wine. Thus the need for some sort of functional wine storage arises and this is where we come in." Typically during this time of the year, Wine Rack Store see's a large increase in customers to its website. Anything from custom wine cellar creations to modular wine racks, down to wine accessories seem to fly off their online shelves. "Things defiantly pick up for the better around here during springtime," said Wine Rack Store Admin Supervisor, Sidney Ray, "It gets a bit chaotic in the office sometimes handling multiple phone and online orders at once, but we all enjoy doing what we do." 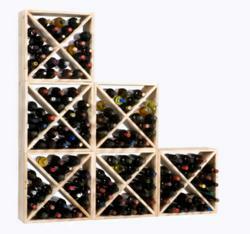 WineRackStore.com defiantly provides wine storage shoppers and one stop spot for all their wine related needs. With their recent expansion on their Wine Furniture options and the addition of oak to their custom cellar creations, customers can fulfill all their wine rack needs to make the most of their summer parties.